BUY YOUR 2019 TICKETS NOW! Mark your calendars for the 2019 event. 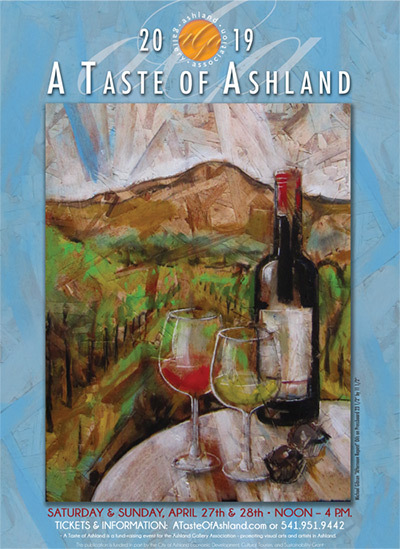 Celebrating its thirtieth year, A Taste of Ashland is the Ashland Gallery Association’s signature fund-raising event. Foodies and wine connoisseurs from all along the west coast follow a map to 17 galleries, to discover Ashland’s best restaurants and the region’s best wines. A complete list of the 2019 pairings will be coming soon in the Galleries/Wineries/Restaurants tab. Despite demand, tickets to the Taste remain limited so as to ensure that it is not over-crowded. A free shuttle by AllAboard Trolley, will offer rides to all 17 galleries, but most are within walking distance. For more information about A Taste of Ashland, please email tasteofashland@gmail.com.